There are two types of communication protocol uses for Socket Programming in C# , they are TCP/IP ( Transmission Control Protocol/Internet protocol ) Communication and UDP/IP ( User Datagram Protocol/Internet protocol ) Communication . In the following section we are going to communicate a C# Server Socket Program and C# Client Socket Program using TCP/IP Communication Protocol. 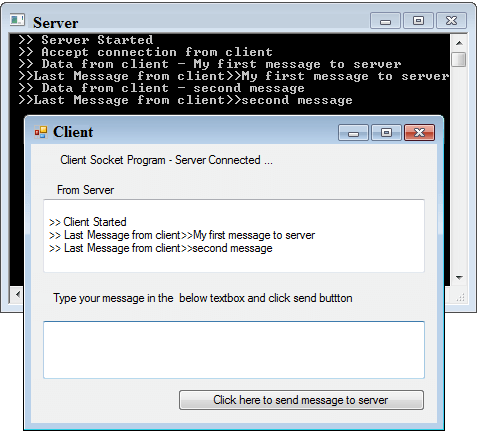 The above picture shows a Server and Client communication interfaces in C#. The Server Socket Program is done through a C# Console based application . Here the Server is listening for the Client's request , and when the C# Server gets a request from Client socket , the Server sends a response to the Client . Click the following link to see in detail of a C# Server Socket Program. The C# Client Socket Program is a windows based application . When the C# Client program execute , it will establish a connection to the C# Server program and send request to the Server , at the same time it also receive the response from C# Server . Click the following link to see in detail of C# Client Socket Program. The C# Socket Program has two sections. When you finish coding and build the Server and Client program , First you have to start C# Server Socket Program from DOS prompt , then you will get a message "Server Started" in your DOS screen, where the server program is running . Next step is to start C# Client Socket Program in the same computer or other computers on the same network . When you start the client program , it will establish a connection to the Server and get a message in client screen " Client Started " , at the same time you can see a message in the Server screen "Accept connection from client" .